Shela is an adorable 8 week old female German Shepherd mix puppy that came in from Monterey County Animal Services. We are happy to say that we currently have Shela, her five sisters and mama Maia all in our program, Thanks to our great team of volunteers, each puppy is in a foster home as well as Maia. Right now we are sorting out which puppies already have adopters, but for now Shela and her sister Bailey are currently up for adoption. All pups still need to be spayed and will be ready for permanent homes in a few weeks. We have also done a DNA test on the pups and we are excited to share the results once they come in. 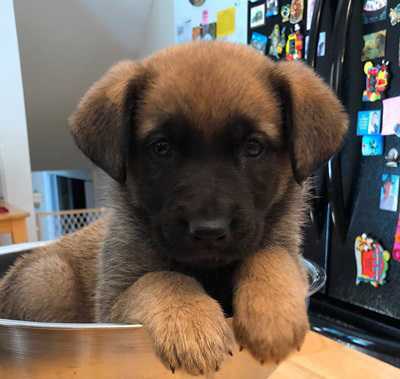 As with all puppies, they will need structure and guidance and only those who have experience raising a large working dog will be considered for this adoption. Sheila and her sister Bailey will be making their debut at our very first adoption day on Saturday, November 10th at PetSmart in Mountain View. Stop by to say hello and get some puppy kisses from our two little new munchkins. Shela is currently being fostered in San Jose where she resides with 2 other German Shepherds and a family with older children.